Try this Bella Marie recipe and sip on a unique cocktail! 1. Mix spirits together (except wine) and dissolve the first pinch of salt in liquid. 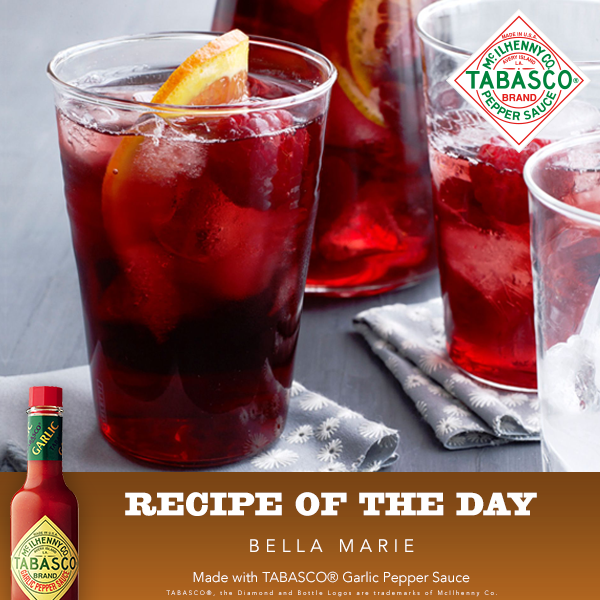 Stir in TABASCO® Garlic Sauce, tomato juice, lemon juice, mustard, and 1 grind of pepper. Add to mixing glass and fill with ice. 2. Mix back and forth between two glasses; strain into fresh ice in tall glass. 3. Garnish with pepper, salt, basil leaf, garlic clove, and float red wine on top.